VIDEO FOR ‘WALKING CONTRADICTION’ RELEASE PARTY AT BOOK SOUP IS NOW AVAILABLE! Today marks the 2 year anniversary of my book signing/release party at Book Soup in West Hollywood with fellow author Carla Harvey! I released my 2nd book, Walking Contradiction, and Carla released her 1st, Death and Other Dances. You can watch the reading and Q & A session HERE. Our books are available on Amazon and Kindle worldwide! ‘BIG ROCK TALK‘ THIS SATURDAY, APRIL 16TH WITH RYAN ROXIE OF ALICE COOPER! I’m stoked to announce I’ll be chatting with Ryan Roxie of Alice Cooper on Episode 4 of his new show, BIG ROCK TALK this Saturday the 16th! One of my first shows was in 1986 watching Gilby Clarke and Ryan in their previous band, Candy, so I’m sure we’ll have plenty to chat about. 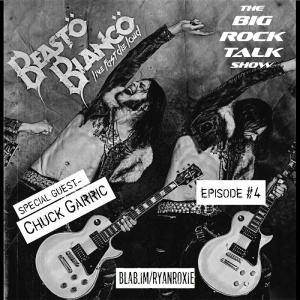 Also appearing on the show is bassist, Chuck Garric of Alice Cooper and Beasto Blanco! Watch the live stream this Saturday the 16th at 10:00 am PST HERE or go to blab.im/ryanroxie. If you miss the live stream, you can watch the replay on YouTube HERE. My segment starts around the 26:00 minute mark. NEW INTERVIEW IN FRENCH ONLINE MAGAZINE, ‘GLAMOUR PILL’! Check out my recent interview in the latest issue of French online magazine, GLAMOUR PILL! The 9th issue also includes powerhouse female vocalist, Dilana from CBS’s show Rockstar: Supernova, and Robin McAuley from the McAuley Schenker Group! I talk about run ins with Tommy Lee and how the Sunset Strip has changed over the last 25 years. Click HERE to read the interview on page 5! NEW WEBSITE AND SPOILERS FOR MY 3RD BOOK, “Crazy Party of One”. Happy New Year everyone! A new year calls for a new website! Over the holidays, I began searching through my old trunk of photos. I found a number of candid and live photos from various musicians and artists you may be recognize. 🙂 I’m in the process of digitizing everything, so keep checking back each week for new photo albums and other book related goodies! PERISCOPE, NEW BOOKS, AND CATHOUSE LIVE! If you’re a fellow Periscope user, lets follow each other! You can find me at marisatellez73. And don’t forget to tune in this Saturday, August 15th as I bring you live footage throughout the day of the CATHOUSE LIVE show in Irvine! For more information, go to CathouseLive.com. BOOK RELEASE PARTY PHOTOS AND ‘WALKING CONTRADICTION: THE CRACKPOT CHRONICLES’ ON AMAZON.COM! My book reading and signing at Book Soup (although mildly nerve wracking) was a success! It was a mix of old and new friends, even a few from my high school! Thanks to all who attended, and a special thanks to Carla Harvey of the Butcher Babies for inviting me to be a part of this dual celebration. If you didn’t weren’t able to attend, I’ve uploaded a few images in the PHOTOS section of my website. Video footage of my and Carla’s reading will be available shortly. I’m also happy to announce that Walking Contradiction is now available on Amazon worldwide on paperback and e-book! Get your copy today! BOOK RELEASE PARTY FOR ‘WALKING CONTRADICTION: THE CRACKPOT CHRONICLES’ ON THURSDAY, AUGUST 28TH AT BOOK SOUP! Please join me at Book Soup as I celebrate the release of my 2nd book, Walking Contradiction: The Crackpot Chronicles! Walking Contradiction is the sequel to Rock and Roll High School. It takes you through my years in television production after the hair metal scene died in Hollywood and also updates you on the whereabouts of all your favorite characters from the first book. I’ll be co-hosting the event with Carla Harvey who is best known as one of the vocalists of the metal band, Butcher Babies. She’ll be promoting her first book, Death and Other Dances. For more information on Carla, please visit her website at www.carlaharvey.com. Carla and I will be doing a brief reading of each of our respective books, followed by a Q & A session and ending with the signing. BOOK SOUP is located at 8818 Sunset Blvd in West Hollywood, California, next to the Viper Room on the World Famous Sunset Strip! We start promptly at 7:00pm and space is limited. Get there early! TUNE IN THIS WEDNESDAY, AUGUST 6th TO THE FULL COUNT PODCAST! You can hear me on THE FULL COUNT PODCAST hosted by comedians Shawn Halpin and Jon Huck, this Wednesday, August 6th. 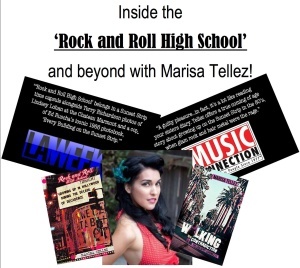 I’ll be talking about my first book, Rock and Roll High School, it’s soon to be released sequel, Walking Contradiction, and all things growing up in Los Angeles during the glam rock era. You can hear the podcast by clicking HERE or going to http://thefullcountpodcast.com. I’ll be on episode 84, so don’t forget to tune in! ‘ROCK AND ROLL HIGH SCHOOL’ FEATURED IN LA WEEKLY! If you’re in the Southern California area, make sure to pick up the jumbo sized “Best of LA” issue of LA WEEKLY magazine for my featured interview about Rock and Roll High School! The “Best of LA” issue is currently on newstands now. The article can be found in the BOOKS section, on page 197. If you aren’t local to the Los Angeles area, you can read the digital article on the LA Weekly website HERE. ‘ROCK AND ROLL HIGH SCHOOL’ REVIEW IN MUSIC CONNECTION MAGAZINE! 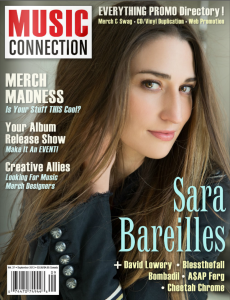 Make sure to check out the September issue of MUSIC CONNECTION magazine for a blurb about Rock and Roll High School in the BOOK STORE section! The September issue features Sara Bareilles on the cover and is currently on newsstands now or you can view a free digital copy HERE. ENTER TO WIN AN AUTOGRAPHED COPY OF ‘ROCK AND ROLL HIGH SCHOOL’! Over the next few weeks, autographed copies of Rock and Roll High School, will be given away to three lucky GOODREADS members! GOODREADS was launched in 2007, and is the world’s largest website for readers and book recommendations. Membership is free! If you’re not a member, join now and enter the contest by going to www.goodreads.com. The contest ends on June 21st. Good luck everyone! SECOND EDITION OF ‘ROCK AND ROLL HIGH SCHOOL’ IS NOW AVAILABLE! The Second Edition of Rock and Roll High School is now available on Amazon.com and BOOK SOUP in West Hollywood! The new edition includes an introductory page to the sequel, Walking Contradiction, and a few pages from the first chapter of the new book! COMING THIS FRIDAY TO BOOK SOUP IN WEST HOLLYWOOD! Starting on March 22nd, Rock and Roll High School will be carried at BOOK SOUP on the infamous Sunset Strip! As one of the last surviving and leading independent bookstores, BOOK SOUP packs over 60,000 titles in-stock, specializing in art, film, photography, music, controversial non-fiction, and literary fiction. With a deep commitment to university, International, and small presses, customers will continue to be surprised by the rare gems found on the shelves. BOOK SOUP is located at 8818 Sunset Blvd, in West Hollywood, California and has proudly served Southern California since 1975. I’m honored and excited to be part of the BOOK SOUP family! SECOND EDITION OF ‘ROCK AND ROLL HIGH SCHOOL’ COMING SOON! In the next few weeks, I’ll be releasing a Second Edition of Rock and Roll High School! Included in the new edition will be an introductory page at the back of the book, which will include the title of the sequel, as well as a few pages from the first chapter of the new book! Stay tuned and thanks so much for all your emails and posts on Facebook, your support means everything! And if you haven’t done so already, please sign up for my mailing list (located in the right hand column on any page of my website) to get the most up to date news on my releases. ‘ROCK AND ROLL HIGH SCHOOL’ FEATURED ON BLABBERMOUTH.NET! Rock and Roll High School will be featured on Blabbermouth.net this week! You can read the full article by clicking HERE. 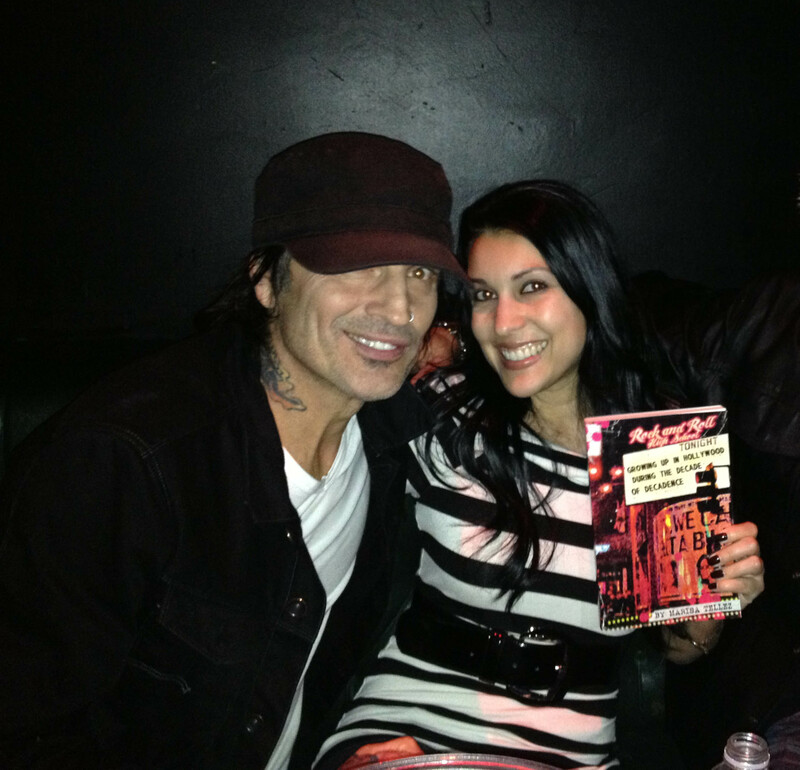 MY BOOK RELEASE PARTY FOR ‘ROCK AND ROLL HIGH SCHOOL’ AT THE VIPER ROOM! Initially, I hadn’t planned on having any kind of formal celebration for the release of my book. But in the end, after some convincing from a few friends that I had every reason to celebrate, I decided to have a party in the downstairs lounge at the Viper Room. 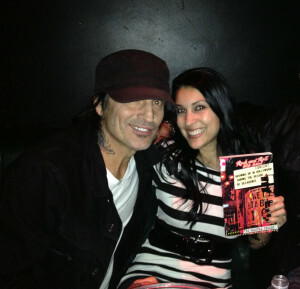 The celebration went off without a hitch and to my pleasant surprise, Tommy Lee was in the house!